Happy Friday everyone! I am so ready for the weekend and cannot believe the levels of craziness that have gone on in our lives this past week. I'll fill you in at a later date. For now though, instead of looking at the crazy, let's take a look at the random stuff from this past week. 1. We have been going to our fertility clinic for over a year and a half now and only just realized that there is no 13th floor. So strange. Where did the 13th floor go? Is it just an empty space? Or human error when making the elevator buttons? Or is someone just really superstitious? 2. I got a new phone and am super excited to finally be able to take pictures again. I had an iPhone 4 and I had filled all the available memory, so picture taking was no longer an option. But I have upgraded to an iPhone 4S (<---- yes, I'm still 3 years behind time) and I can now take awkward bathroom selfies again! 3. 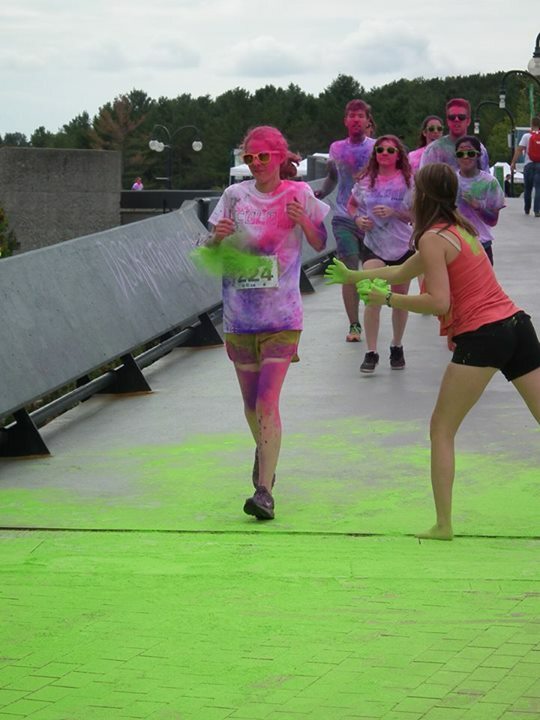 I got one more photo from my 5k run last week and it makes me chuckle. This was taken by the photographers on site and I love how they captured my tight mouthed face as I ran through the cloud of colour. I was super careful to keep my mouth shut and eyes squinted when running through the dust. 4. While shopping at Chapters the other day, we saw this adorable pillow. La vie est belle means Life is Beautiful and both my sister and brother-in-law have tattoos with this quote. I really wanted to get them the pillow but after looking at the price, realized it was going to cost $55. Who the heck spends $55 on a throw pillow?!?! 5. On Wednesday we had our very first full family picnic in the park, which is code for Mia was with us. It was fun to have her there and she was pretty delighted to find out she had food too, instead of just watching us eat. Her food was gone before the picture was snapped though, so that's why it's not in the photo. So there you have it, some fun pictures from the week. I also have "La vie est belle" tattooed on my foot (has to be covered because it's become illegible, boooo) but I definitely want to get it tattooed again elsewhere! and I would totally not pay $55 for a pillow either!!! We have the most adorable wicker picnic basket but rarely use it, since most of our picnics are spontaneous. You should totally get out for one though before the evil cold of winter sets in. I love that you have a "la vie est belle" tattoo, although unfortunate it's now illegible. Glad to know I'm not the only one who thought $55 was a little extreme for a pillow. I'm glad you liked the bathroom selfie, I took it right after my first IUI on Monday so I was trying to look excited. And I doubt anyone would donate to the throw pillow cause! We had no 13th floor in the apartment where we started out, but i've never heard of the 4th, 14th and 24th before. As for full phones, it took me a long time, but i finally figured out how to export all the photos onto my computer, delete them on the phone, and now i'm back to taking pictures! I never knew the missing 13th floor was so common. And I knew that I could export the pictures from my phone and start fresh but we got an awesome deal on the new phone and it just seemed easier. If I fill this one, maybe I'll have to get rid of the 1,000 photos I have on it! Thank you for these wonderful tips! I will do my best not to overload my current phone with photos and try and take them off regularly.